Behold the new gerbil cage for children in Queensbury, New York. Notice that there are no children there. The reason: it is a completely unrewarding place to play. In fact, it was designed not for children but for lawyers in this lawsuit-happy land. In attempting remove every possible hazard to health and safety, they have succeeded in making it boring, de-natured, and quite spectacularly ugly. The chain link fence is a nice touch. 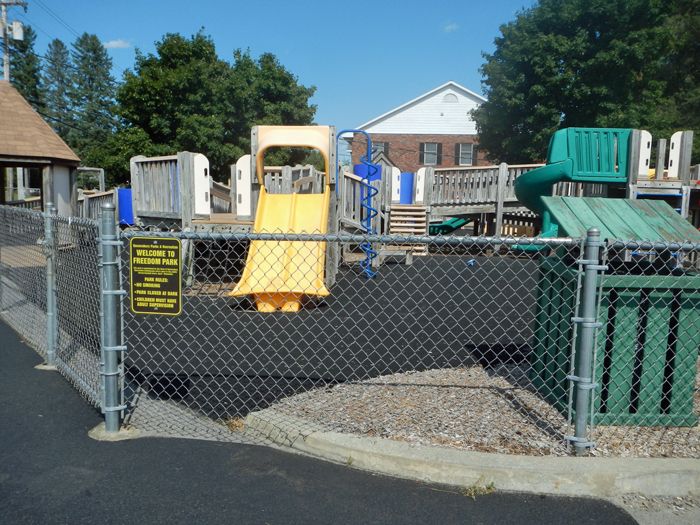 It prepares children for life on Cellblock D.
Check out the black asphaltic-rubberized “play surface.” That’s really inviting, isn’t it? Like the LaBrea tar pit. I wonder how hot it gets on that pad at, say, 4:00 o’clock of a September afternoon. This shot gives you a nice sense of interface between the “facility” and the stuff around it. Parking-lot quality! The sign contains all the legal disclaimers and prohibitions — among which: children must be accompanied by an adult. How sad is that? Thanks to Marisa Muratori for the nomination. Published as an E-book for the first time! If you don’t have young children, you may not know how absolutely typical this playground is. Not only are children prohibited unless accompanied by an adult, but adults are also prohibited unless accompanied by a child. It’s all part of the country’s continuing obsession with child abduction. In fact, there has been a wave of arrests around the country of parents who let their kids go to the park and play. 63% of Americans believe it should be ILLEGAL to allow your 9-year-old to play unsupervised at a public park. 43% believe it should be illegal to let a 12-year-old play unsupervised. In fact, the average American thinks a child should not be allowed to play unsupervised even in his own front yard until he is 11 years old. Even if you’re like me and you let your child play without an adult hovering overhead, he probably won’t do it very often, because there won’t be any other kids to play with. I can tell you how hot that black surface gets on a sunny summer day – 125 degrees. I just learned that at a “pasture walk” I attended, to learn about rotational grazing of our ruminants. In full summer sun the surface temperature of a black animal is the same as that of an asphalt road, 125! Ruminants and kids both need shade, black or not. think of the DANGERS we survived as our criminal parents let us use our very own well-developed sensibilities as early as 6 or 7 years old!! is there a statute of limitations on these abuses, such that our parents who were periously ignorant and oblivious to the need of the nanny state may be summarily punished, retroactively? “Freedom Park” – the cruel irony! In a country where freedom is often strangely and ambiguously defined, and fear seems to rule, this children’s play park is tragically appropriate! I think you all missed the fact that the park was made so kids in wheelchairs could use it along side kids who don’t need wheelchairs. That surface was made for the wheelchairs. Don’t be so quick to judge. Kids in wheelchairs can use it?? 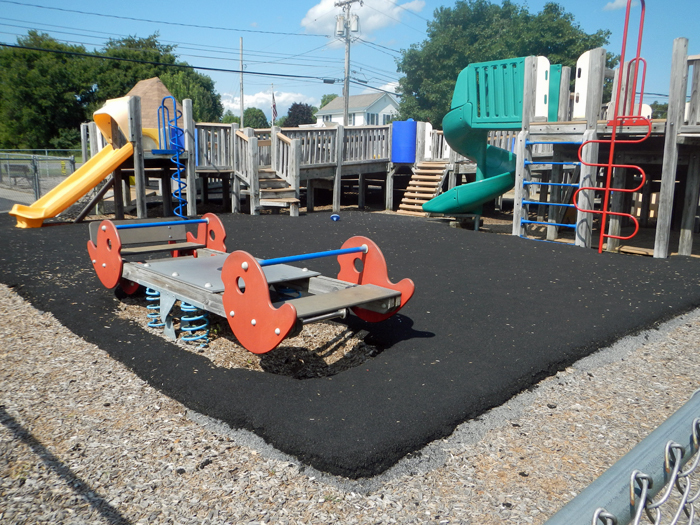 Aside from wheeling around on the scalding-hot rubberized surface and up and down the ramps, which piece of playground equipment do you think they’d use first – the slide or the climbing ladder. At any rate, the lack of shade, prison-style fencing and burn-unit inducing surface are not necessary for a truly accessible place for kids in wheelchairs to play with their cohorts. Besides, it’s not really a playground, more like a half a dooryard. Orwellian doublespeak is alive and well at Freedom Park: a “barrier-free” playground? More like prepping youngsters and parents alike for Camp FEMA. I suspect the park ranger will also have a “special” uniform The only thing that is missing (other than human beings) from the photo is a band of concertina wire at the top of the chain link fence to complete the cordon sanitaire. Well, I don’t know… it seems like an applicable reflection of our economy and society to think that- large ‘pillows of oil and rubber’- will protect and prevent users of this fine playground from being harmed (as long as they don’t use the equipment). A castle, made of cartons, rocks, and old branches, by a group of children for themselves, is worth a thousand perfectly detailed, exactly finished castles, made for them in a factory. 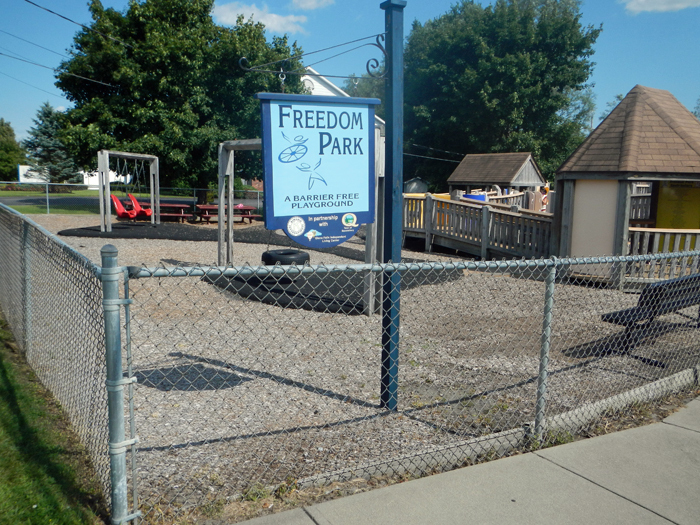 Kind of a weird picture there too of “Freedom Park”, like what is up with that picture of a child about to get clobbered.. It looks like a piece off a wheelchair. Hey if you were the windows 10 user then from our website get learn that where are my desktop icons in windows 10 operating system in few steps by getting help support from our tutorial which you will do it online in few steps.